A new cross-laminated timber factory is expected to employ 150 people in Spokane Valley. Want to put up a building? OK. You'll just need an architect, an engineer, a contractor, an electrician, a plumber, an HVAC installer, vendors for timber, sinks, cabinets and faucets, and maybe a few other folks to contract onto the project along the way. But what if you only had to go to one source for all those things? Two-year-old design-build company Katerra, based in California, is doing just that, and Spokane Valley is set to become a key part of their plan. "Katerra is intended to be one throat to choke for the entire construction process," says Fritz H. Wolff, one of the company's three co-founders. "It's owning everything in the construction process and minimizing the amount of handoff that has traditionally happened." This fall, Katerra, which labels itself a technology company, will break ground on a 250,000-square-foot mass timber factory near Trent Avenue and Barker Road. It's expected to create at least 150 manufacturing jobs locally, and could grow thousands of construction jobs around the country. 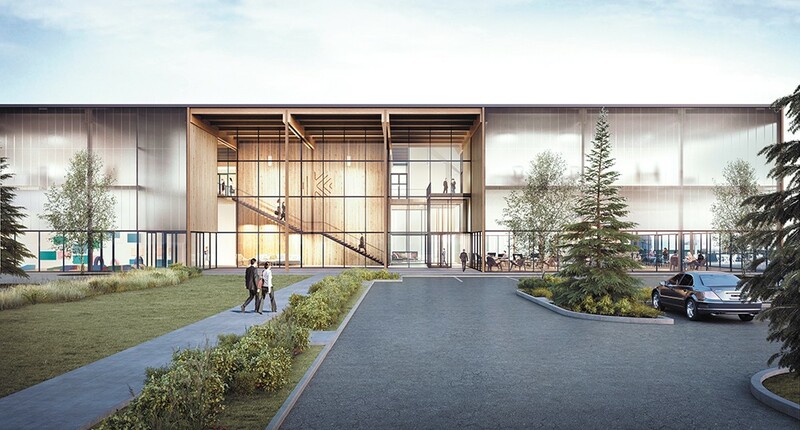 The facility will be used to manufacture glulam and cross-laminated timber (CLT), wood products that are being turned to more often as more sustainable and cost-effective alternatives to traditional building materials. Because the lion's share of the wood will likely be sourced from forests in the Pacific Northwest, the facility could revive some local timber industry jobs, which have lagged in recent years. The company chose Spokane Valley for this part of its plan in part because of its proximity to timber resources, access to rail lines and the freeway, and closeness to major markets in the Northwest, Wolff explains. It probably doesn't hurt that Wolff's family has a long history here: he's also the CEO of real estate builder and investor the Wolff Company, which was started in Spokane in 1949. Where typical projects basically function as "one-off prototypes," Katerra's website explains that the company hopes to streamline basic parts of the building process, to make building more like the manufacturing industry. As with other technology, as the company creates methods to become better, faster and cheaper, they'll be able to make construction and construction-related jobs viable that otherwise wouldn't be available in today's market, Wolff says. When starting the company, Wolff worked with Katerra's other co-founders, Jim Davidson and Michael Marks, both of whom have many years of experience in the tech industry, to see what lessons they could take from electronics manufacturing and apply to building. "That industry has had great gains in innovation, dragging quality up and cost down for consumers," Wolff says. So what does that really look like? Katerra recently opened another factory in Arizona, which is being used to manufacture fully built components like countertops, doors, cabinets and fully built walls. "[For the] concept of enclosed wall panels, we complete the framing, doors, the windows, the electricity, the plumbing, the sheetrock, and what's shipped to the site is a finished wall that's stood up and plugged in," Wolff says. In large construction projects with many repetitive parts, like apartment buildings, the company is saving a lot of time and money, while boosting the quality, he says. "Let's take a three-story, walk-up apartment building. That used to take three or four months in the best-case scenario to get to dry-in, with doors and windows and framing complete, and a roof that's on, so you're now doing finish work that's out of the environment," Wolff says. "Katerra has demonstrated it can do that in plus or minus two weeks." As a Katerra customer himself (the Wolff Company has hired Katerra for its own building projects) Wolff says those savings will help provide what he refers to as essential housing. "I don't like the connotations that come with affordable housing. Every community has essential employees," Wolff says. "From my perspective, Katerra enables us to deliver to a renter constituency, for example in the apartment market, that isn't able to be reached without the tools that Katerra enables. Katerra enables us to provide that essential housing without sacrificing the quality." The factory could make CLT materials more accessible to projects across the country. 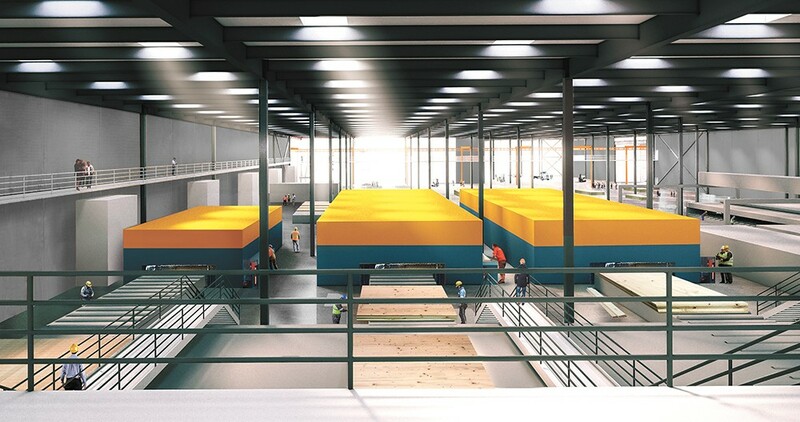 While the Spokane Valley factory won't be making components such as the fully built walls, CLT and mass timber made there will be key structural components in many Katerra-built buildings. "Cross-laminated timber is part of a thirst to do things not only more efficiently, but effectively. CLT is very helpful in assembling faster than traditional methods," Wolff says. The material, which is made by gluing strips of wood together in perpendicular layers, has been used for decades in Europe, but has only recently been adopted as a building material in the United States. Spokane just got what planners believe was its first CLT building earlier this year, when Beacon Builders put up a new gym for CrossFit Duratus on North Helena Street. One of the first projects Katerra plans to make with its CLT locally will be a new Hospitality Center in association with the Community Cancer Fund, Ronald McDonald House, and Kootenai Health's Walden House. The new building, expected to be finished by 2019, will provide a place for families to stay while their kids are in the hospital, as well as provide rooms for adult outpatients and their families while they receive treatment at Kootenai Health Facility. The material has been lauded for its sustainability, as it can reduce the carbon footprint for building projects and keep carbon sequestered in the timber. Smaller trees that aren't otherwise used for building can be used to make CLT, helping thin forests and reduce wildfire risk, and even trees that have been killed by beetles can be used. "Everything that we're looking at, we're hopeful that we can have an impact on environmental sustainability," Wolff says. Until a few years ago when factories were opened in Oregon and Montana, all CLT had to be shipped in from factories in Canada and around the world. With the new Spokane Valley facility, Katerra also hopes to scale production of CLT in the U.S. so more people across the industry will use it.